Liquid Quartz | zAlbee's Interblag. Here’s something that might sound strange. Today, while playing the retro puzzle game “Mushroom Man” — a great throwback to “Chip’s Challenge” — I noticed how similar one of the levels was to solving a programming contest question. In level 113 “Don’t Drink the Water,” there is a large number of water tiles and only a limited amount of oxygen available to cross those tiles. At one point, I found myself on a spot where all paths left me exactly 1 oxygen short. Eventually, I needed to work backwards, counting the tiles to look for a solution. The shape of the level — a 10×10 grid with the goal in the corner — reminded me a lot of a dynamic programming solution where you would fill in a 2D integer array. The origin of the term dynamic programming has very little to do with writing code. It was first coined by Richard Bellman in the 1950s, a time when computer programming was an esoteric activity practiced by so few people as to not even merit a name. Back then programming meant “planning,” and “dynamic programming” was conceived to optimally plan multistage processes. Six months ago, the battery in my 2010 Mazda 3’s key fob (aka “flip-key”) totally died and I needed to replace it. 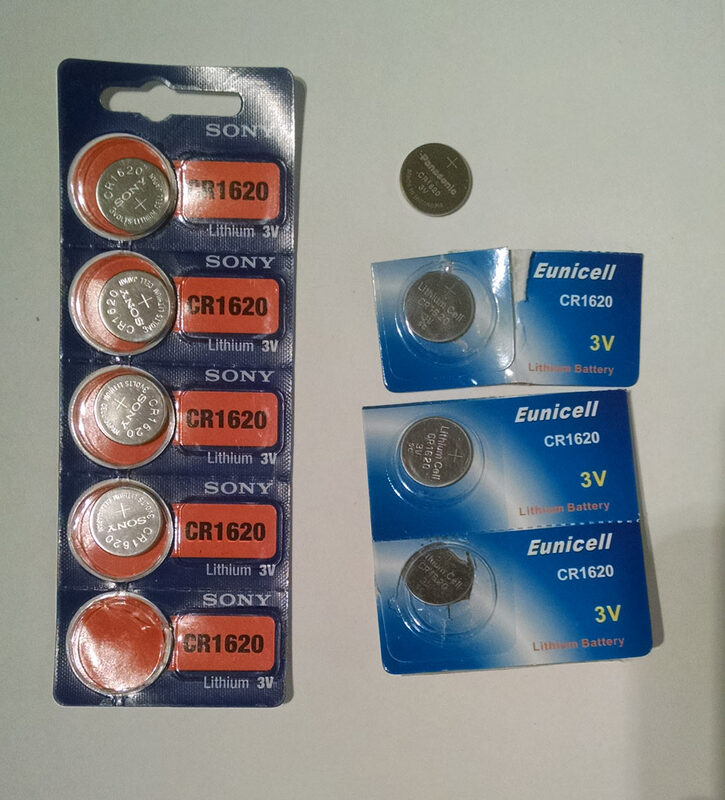 The battery in these things is a CR1620, which I couldn’t find anywhere in stores, so I ordered the cheapest ones I could find off eBay — a pack of 3 generic brand Eunicell (made in China) for $2.18 CAD shipped. Unfortunately, I didn’t have a good first experience with them. There’s an orange LED that should light up whenever you press a button on the key fob. On a working key fob that still contained the original Panasonic battery from the manufacturer, the LED was bright and solid, but on the one I had just replaced, it was flickering and dim. I actually couldn’t get the first battery to work, so I had to take a 2nd one from the 3-pack, and that eventually did work, but never 100% reliably. I also had to reprogram the key fob to be recognized by my car. I concluded that these batteries were just “weak” or underpowered, or that the eBay seller was giving me old/used stock (I now realize that this wasn’t true. EDIT: it turns out my original suspicions were probably correct; see update below!). Anyway, a week ago, I sought out a brand name and ordered a 5-pack of Sony batteries (made in Japan) from Amazon, which cost me $13 all in (including Ontario taxes). Left: 5pcs Sony CR1620 (made in Japan), about $2.60 each. Top-right: Original Panasonic battery (made in Indonesia). Bottom-right: 3pcs Eunicell (made in China) from eBay, about $0.73 each. If I hold the left mouse button for a long time, such as if I want to select a long section of text, it will randomly “let go” and my selection will be broken, even though my finger did *not* let go. Another case is if I click and hold a scroll bar to slowly scroll a webpage, it will randomly “let go”, as if the button released and re-clicked by itself. Fortunately, Logitech has an excellent 3-year warranty and my mouse was only 2 years old, so they sent me a brand new G500s (the G500 model is now discontinued). Being the holiday season, I decided to gift the new one to my brother, use a spare mouse at work (3.5-year old MX518, still going strong! ), and make do with my semi-broken G500 with the ghost-clicks at home. This is a bookmarklet that sets a dark background colour on Kongregate game pages. The goal of this script is to dim nearly all the elements on the page, so as not to distract the player with bright lights, while keeping the chat box and achievement tabs legible. EDIT (Dec. 11, 2012): I updated the script to version 2, which colourizes more elements. 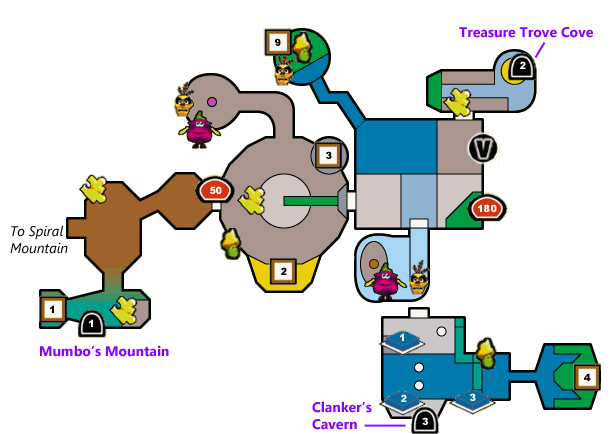 I found these maps originally here, but there were two level locations missing (Clanker’s Cavern and Freezeezy Peak), so I decided to edit them. I added level labels, as well as colour-coded the cauldron portals — cauldrons with the same colour dot teleport to each other. I was browsing the Kongregate forums one day, when a post caught my eye. It was a list of broken games on the site that still had achievements to earn, and the clever ways that people had found to progress in those games far enough to earn the achievements. 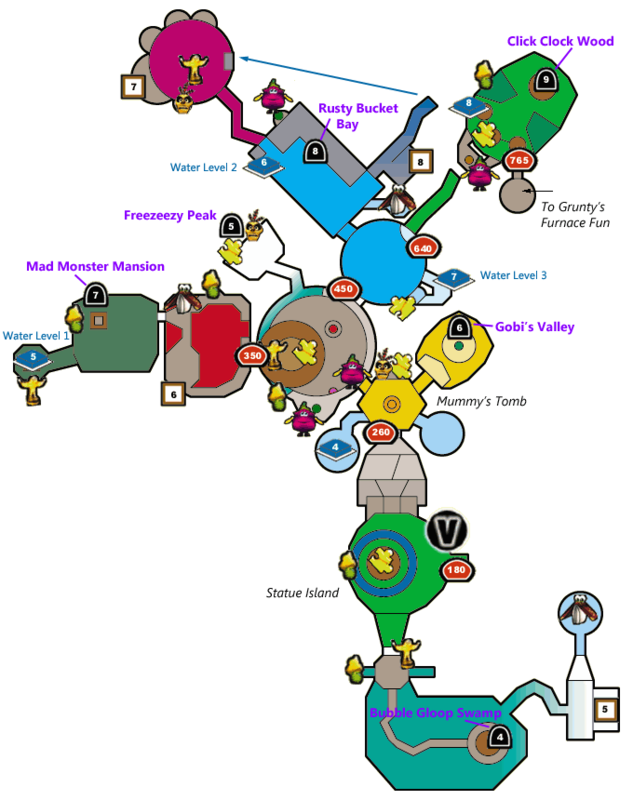 Sola Rola: The Gravity Maze was one of the few that hadn’t been solved. This game was interesting because not only was it broken on Kongregate, it was also broken on every single other Flash game portal out there, including the game’s own sponsor Gimme5Games and the website of its creator, EvilFree Productions. This was a simple physics-based game where you rotate the environment, similar to Loco Roco, but with its own cheeky characters having to navigate a maze. Around September 24, 2010, something changed that broke the game. No matter which website or computer you accessed it from, the game would show the sponsor logo and then a blank white screen. For two years, seemingly no one could figure it out, so in September of 2012, I set out to investigate it myself. Two weeks later, with the help of the Kongregate community, we were able to recreate the original levels to get a working version of the game for people to play and — if they are into this sort of thing — earn the achievements. A few people already found out why the game doesn’t load. When the game starts, it tries to load two XML files: translate.xml, containing language strings, and levelList.xml, containing the level list. The problem is these files were ONLY located on the Gimme5Games server and the files are now nowhere to be found. This explains why the game was broken no matter which portal hosted the game (SWF file). After an hour of fruitless searching through internet archives, and several efforts to contact the developer, it was clear the original files would not be found. Another approach had to be taken. In April of 2012, askon, a Kongregate user, posted the source code decompiled from the game’s SWF file, and a way to fool the game into starting with an empty XML file. All that was missing were the contents of that file — the level data! Fortunately, someone had recorded every single level of the game on Youtube, so we had hope to reconstruct the levels, if we only we knew the structure of the XML files. That is where I would come in. More on that later. The hosts file entry bypasses the DNS lookup and redirects requests to our server. 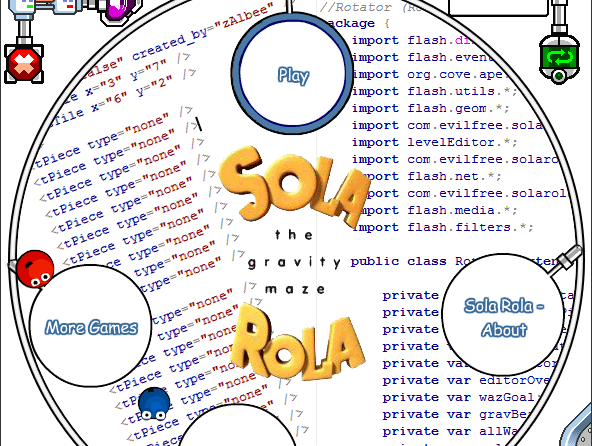 When the game starts, it requests the XML files using ordinary HTTP requests to “http://www.gimme5games.com/solarola/translate.xml” and “http://www.gimme5games.com/solarola/levels/levelList.xml”. Since those are gone forever, we need the game to look for those files on a different server — one that we control. One obvious way would be to modify the compiled SWF file itself, however that wouldn’t allow us to earn achievements on the Kongregate site. Instead, we will redirect the request at the DNS lookup step. The easiest way to do this is to modify the “hosts” file of the local machine. 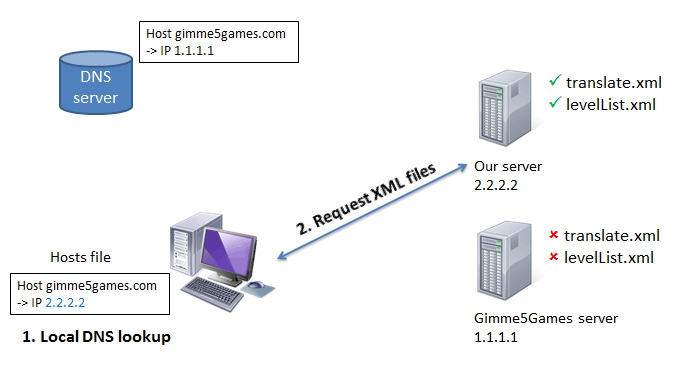 Now, instead of asking a remote DNS server for the IP address of gimme5games.com, our PC will simply use the entry in our hosts file. TSN.ca offers free video-on-demand (VOD) replays of full Eurocup matches this year. However, on the same page, they also have links to highlight clips, whose titles are unfortunately shown along with the final scores. So if you were planning to watch a full match, the result has already been spoiled once you visit the page. My brother brought this up, and I came up with the following solution – a user script to hide/remove the scores from the VOD page. There are two scripts. The first simply removes any numbers from the Highlights row. The second removes the entire Highlights row, including the thumbnails (which could be a spoiler as well). Use whichever you like. The 2nd script is best for maximum protection from spoilers. This was tested to work on Google Chrome (v19) and Mozilla Firefox (3.6). 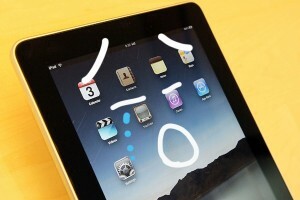 When Apple first announced their first ever tablet, the iPad, I wasn’t too interested. Like many people, I laughed it off as a giant iPod Touch with a silly name. A large, expensive touchscreen with no physical keyboard or buttons, running only toy apps designed for an iPod/iPhone, minus the phone capability — sounds pretty useless, right? (Well, we all know how that turned out.) Imagine my surprise when my fiancée’s father had already bought one — with 64GB and 3G, no less — and moreover, he didn’t have a use for it, so they were going to give it to me! I wasn’t sure whether to be excited or tell him he’d wasted his money. After all, I didn’t have any real use for it either, but it would be my first iOS (actually my first Apple) device, and I wanted to see what all the hype was about. Fast forward 10 months later, and I was starting to find a use for the tablet… in bed. No joke. I kept it on a nightstand unused for weeks at a time (a testament to the great battery life), and only picked it up after an especially tiring day, when I just wanted to lie back and relax. (Why? If I’m awake, I’d be using my real laptop connected to a 23″ monitor at my desk.) I loved the large touch-screen, the light weight, and the long battery life, but it was also frustrating. So much potential, but there was so much that I just couldn’t do. 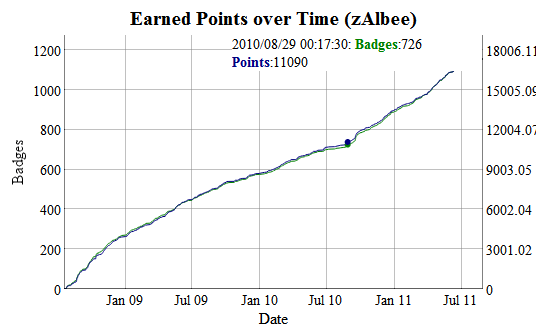 Some interesting graphs I conjured up a while back for achievements earned on Kongregate, the popular Flash gaming portal. The first one is based on user data collected by MrRubix in late August 2011. 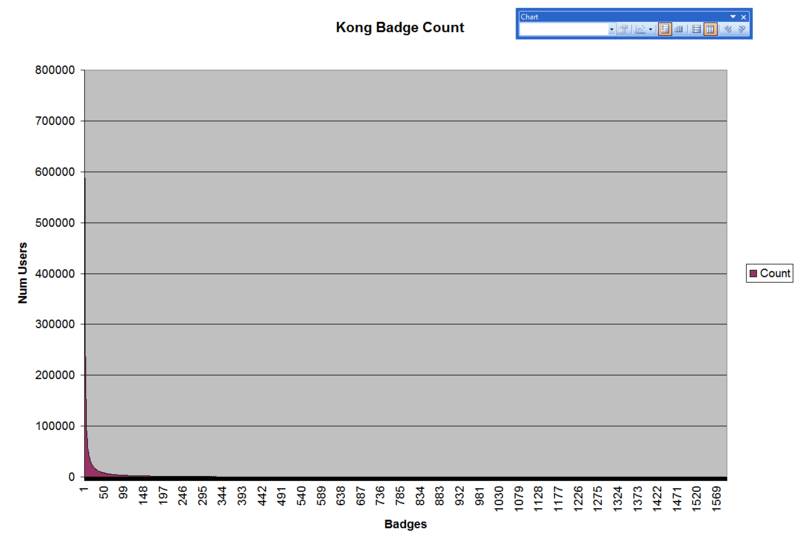 It shows how many users have collected a certain number of badges. The data is very bottom-heavy, so it’s using a log scale (for amusement, the graph using a standard scale is mostly useless). 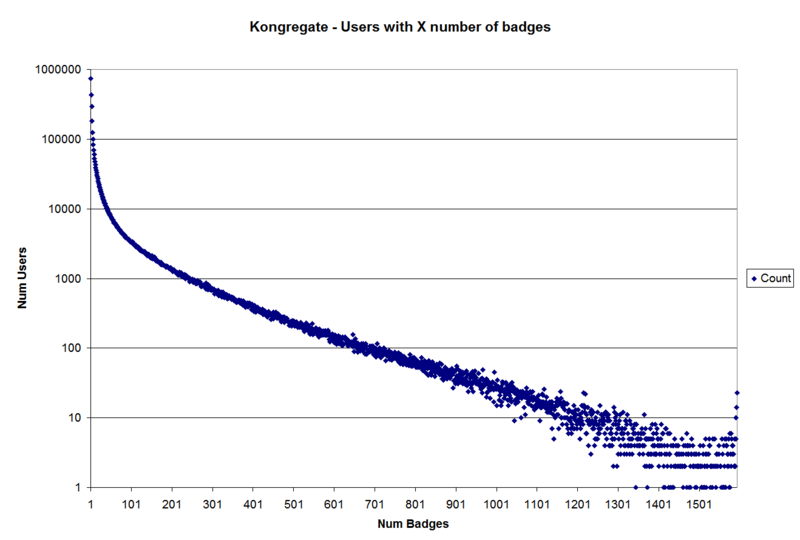 744670 users have only 1 badge, while only 23 users have all 1593 badges (the max number at the time). Interestingly, the graph is mostly descending until the end, where there’s a sharp increase.